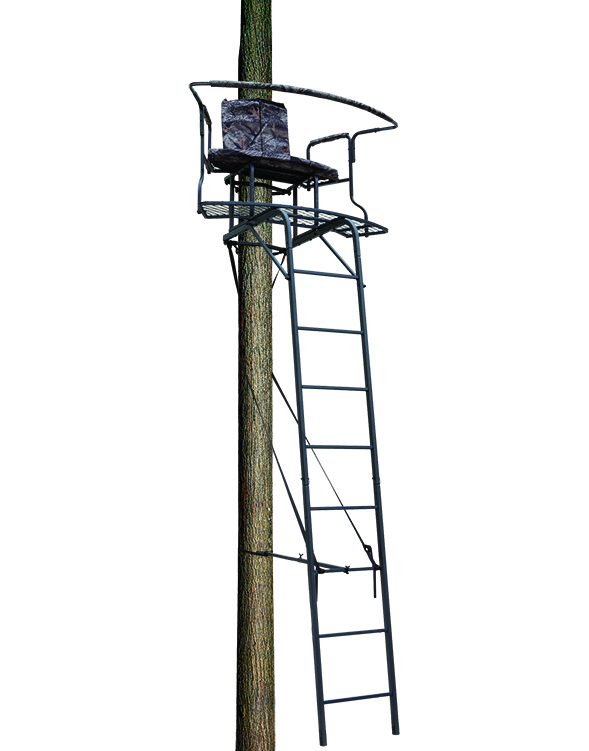 The Big Dog BDL-1050 tree stand boasts a unique design and structure and is a great alternative for hunting big game. It is capable of withstanding the test of time thanks to its rugged build, and the seat that it has been equipped with will allow you to hunt along with a friend if that’s what you’d rather do. It is primarily intended for two users due to its weight capacity, but you can, of course, use it on your own. It’s durable and versatile and it is capable of standing a lot of risks and circumstances where many of its competitors would fail to be capable of serving you. Let’s look at some of the features that make it stand out from the crowd. If you are a bowhunter, you probably know how inconvenient it can be to have to maneuver your weapon as best as possible in a tight space. That’s what happens with most tree stands available out there, but you won’t be hindered by this aspect if you decide to go for the Big Dog BDL-1050. It is capable of maximizing space for the hunter, since its stadium seating design curves around the trunk of the tree, which in turn gives you a far better angle of attack than what you would benefit from if you were to use a different model. The stand is capable of seating up to two individuals, but if you are a lone bowhunter, you’ll be glad to know that this unit allows you to get in any position you might need. Even when two people are sitting in it, the platform of the tree stand has a shape and a size that are effective and that ensure optimal mobility. The foot platform measures 53 by 13 inches while the padded seat measures 37 by 16 inches. We’ll tell you right off the bat that this product does come with a bit of an inconvenience and it consists of the fact that you won’t be able to slouch since the size of the platform is maximized by making the seat somewhat shallower. However, when it comes to the other comfort-related features, you won’t fail to be impressed by what this alternative has to offer. The stand comes with more than enough cushioning that can keep you comfy. The armrests, the seat, as well as the shooting rail, are all padded. There is some adjustability you can benefit from, too, and you can customize the ladder support bar and the ratchet straps which have the role of securing the stand to the tree. Since the foot platform is sizeable enough, you can stretch out your legs and adjust your body when you’ve been sitting in the same position for quite a while. The weight capacity of the Big Dog BDL-1050 tree stand is 500 pounds, so you can rest assured that you can either use it with a buddy or bring quite a lot of gear with you and still not have to worry about jeopardizing the security of the setup. Furthermore, this product is designed with 2 fall arrest systems and comes with a safety harness, so you can feel as safe as possible while sitting in it and focusing on your hunting performance. Even with all of these advantages, the product can still be considered affordable, so you can take a deep breath and say to yourself that you won’t have to spend a fortune to get this one. No one wants to pay for a tree stand that doesn’t give them their money’s worth over time. You need to know that the product is reliable enough and that it can hold you properly, but you also want to make sure that you don’t run into any issues that will force you to replace it ahead of time. Fortunately, this isn’t a cheap tree stand that will fail you before you get to use it for as many hunting seasons as possible. Its steel construction allows it to last for a good deal of time, and besides, it also ensures corrosion-resistance, although we would like to advise you to check on its parts regularly and use an anti-rust spray if you notice any issue in this sense. 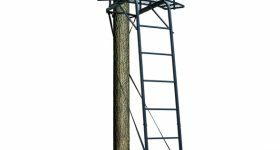 In short, if you’re looking for a sizeable ladder tree stand that can accommodate yourself and your gear without any problem whatsoever, this one is definitely worthy of your consideration.